Just the Bases: Welcome! Just the Bases Has Launched. 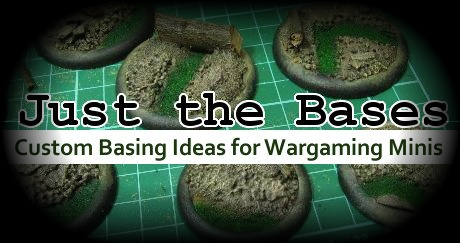 Welcome to "Just the Bases", a blog dedicated to making custom bases for miniature wargaming figures. There are few things as a sad as a beautifully painted mini on a plain, plastic base...we're here to help you change that. What can you expect to see on "Just the Bases"? -Various tutorial articles on how to make your own miniatures come to life with simple basing techniques. -Pictures meant to inspire your base crafting. -A wide array of themes representing many different environments for your bases(desert, stone, winter basing, forest, etc.). Our goal is to become a repository of basing ideas for you to access as you put the finishing touches on(or are building) your miniature. We'll certainly "dress up" this site soon...it's obviously a bit stoic right now...but look for plenty of things to be happening here right around the corner.